Issue #11 - No Silly Questions! I always told my students at the beginning of the term “There are NO silly questions. Just ask!”. Here are the 3 questions I am asked most often in case you haven't dare to ask me yet. How many ounces in a typical wine tasting? Typically, I pour 2 ounces for a technical wine tasting, for which the objective is to evaluate the wine aroma and taste qualities. You can go as low as 1 ounce and as high as 4 oz. The more the sample volume, the less the number of wine samples you can taste in a session. How much wine is in a tasting pour in a winery? Well it depends, in general 1 oz. The winery rules may limit the number of pours to 4 for liability reasons. How many wine tastings can you get from one bottle of wine? A bottle of wine has a volume of 75cl, about 26 oz. I have served 20 wine glasses out of a bottle pouring 1 oz and keep a bit for retaste. For social wine drinking, event planners count a bottle of wine for 6 guests. Wine Tasting Demystified has a wine aroma dictionary available for you to find information on specific wine aromas you may perceive in wine. Often, I am asked about weird aromas, i.e. wine aromas that are not expected in a wine. Here is a list of the wine aromas most frequently asked about, and a link to the corresponding wine aroma dictionary page on my site. How can a wine taste like caramel? Usually, caramel is perceived in oak barrel aged wines. READ MORE . Is it possible that I smell some kind of nutty note? Well, yes it is possible. Hazelnuts, walnuts could be imparted by oak barrels too. READ MORE . No, the wine was not contaminated by soil. Earthy smells could be the results of aging, however, they are more likely due to contamination. READ MORE . Now, if the wine smells musty, it is likely due to a bad cork. READ MORE . This white wine smells like sherry. What's wrong? This wine might be oxidized.The wine sample may come from a bottle that was opened few days before and the wine was exposed to too much air. READ MORE . How come this wine smells like gasoline ? Gazoline or kerosene are often perceived in aged Riesling wine. READ MORE . FAQ-3: What the best aroma kit? This question comes on and on. The best aroma kit is the one you can create yourself with actual products such as fruits, spices etc added to a base wine. However this homemade kit can not be stored for long and is not convenient to carry with you. That’s why commercial aroma kits are very convenient, even if there are some drawbacks. For example, the aromas tend to be very strong and you are quickly saturated if you smell them directly from their flasks. A better practice is to add few drops into a base wine for a more realistic aroma perception. Training with a wine aroma kit is the best way to enrich your vocabulary . Create a homemade wine aroma kit . Review of the Red Wine Aroma Kit designed by Wine Awakenings . Feel free to contact me directly if you don't see the answers you are looking for. Just ask! What's new at Wine Tasting Demystified? I have attended two conference in September. The first one was in Verona, Italy for Eurosense, an academic conference for sensory scientists. More than 700 attendees participated in 4 days of presentations on new methods and advances in sensory and consumer sciences. There were not a lot of papers related to wine. However, one picked my attention. How to describe wine body? 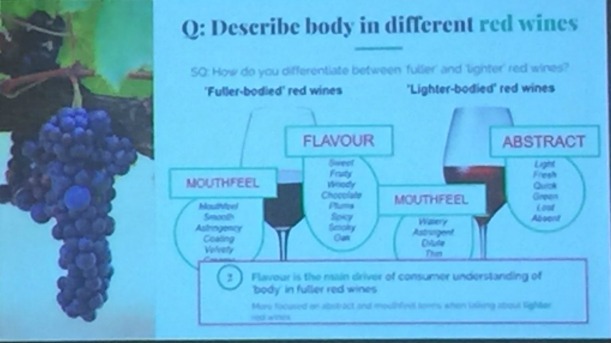 The authors from University of Adelaide conducted several tests with UK consumers to understand how they described wine body, for both white and red wines. They found that both tactile, chemical, and aromatic components contributed to the perception of "wine body". Apologies for the fuzzy picture I took during the conference. I just came back from Cleveland. My flight to Atlanta was delayed for several hours. After waiting at the gate, on the plane, and back at the gate, my colleague and I took comfort in going to the bar just beside the gate. 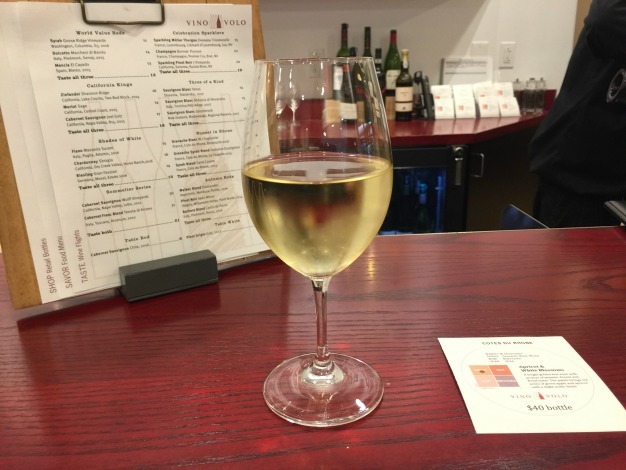 Have you been to Vino Volo before? This wine bar was very welcoming and only served wines. The crowd was different from the usual airport bars I have been to. No giant TV screens! There, we were presented with a wine tasting menu. 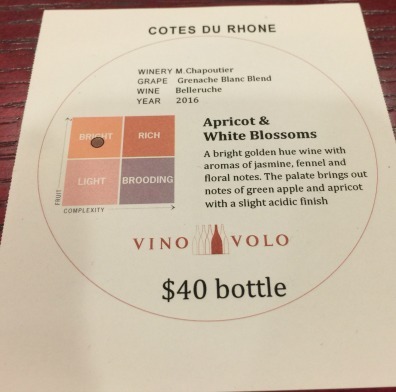 I chose a Grenache blanc and was presented with a coaster where the wine information was printed, plus a generous sample size. You may want to check out if there is a similar wine bar at your next airport stop over. .